WAIST HIGH: Good Firearm News Coming Out Of Anaheim. Good Firearm News Coming Out Of Anaheim. ANAHEIM -- Many Disneyland visitors are cheering now that skippers on the Jungle Cruise ride can pack heat again. 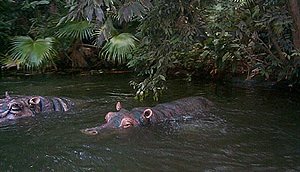 For more than 40 years, the mechanical hippos would lunge threateningly out of the water at every boat that toured the park's Amazon River, only to be repelled by skippers firing their sidearms. Then, in 2001, political correctness appeared to accomplish what the hippos never could. The skippers were disarmed.